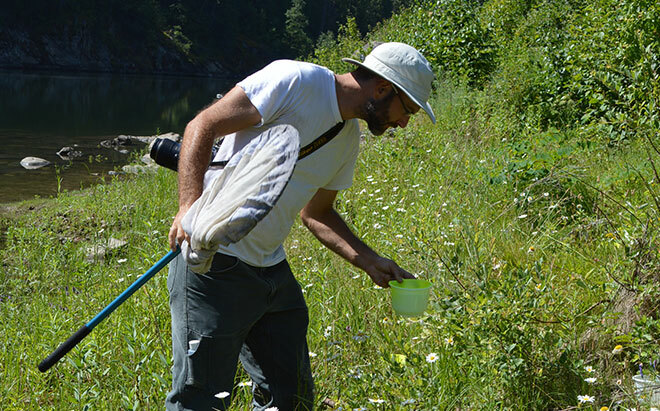 Pollinator inventories have been part of the WTCP Program. Mike Hounjet photo. Castlegar, BC – The Waneta Terrestrial Compensation Program (WTCP) has selected five projects for funding as part of a mandate to support habitat restoration and conservation activities during the construction and Final Acceptance phases of the Waneta Expansion Project south of Trail. Since beginning in 2012, Waneta Expansion Project partners Fortis Inc., Columbia Power Corporation and Columbia Basin Trust have distributed a total of $350,000 to 37 research, physical works and applied projects in the Pend d’Oreille. Butterfly and pollinator inventories, research on reptile species and rare plant studies are some of the activities that have taken place. The program is now complete. Jakob Dulisse, a wildlife biologist whose work through the compensation program has focused on reptile habitat conservation, notes that the program has been key in helping to create better awareness of the importance of the area. To view a list of all projects supported through the Waneta Terrestrial Compensation Program between 2012 and 2018, visit http://columbiapower.org/wtcp.